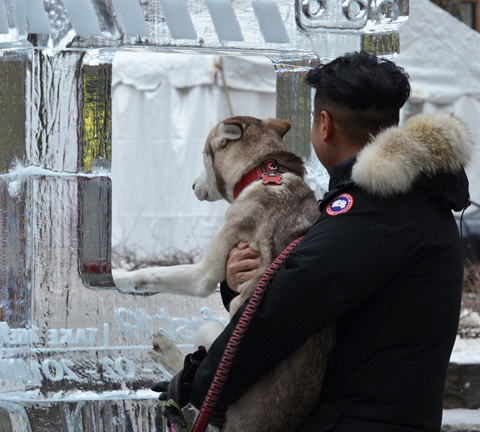 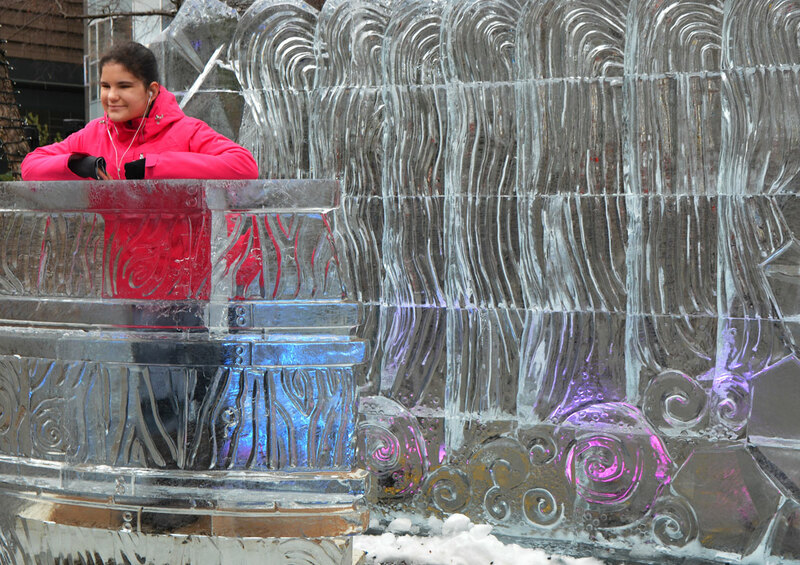 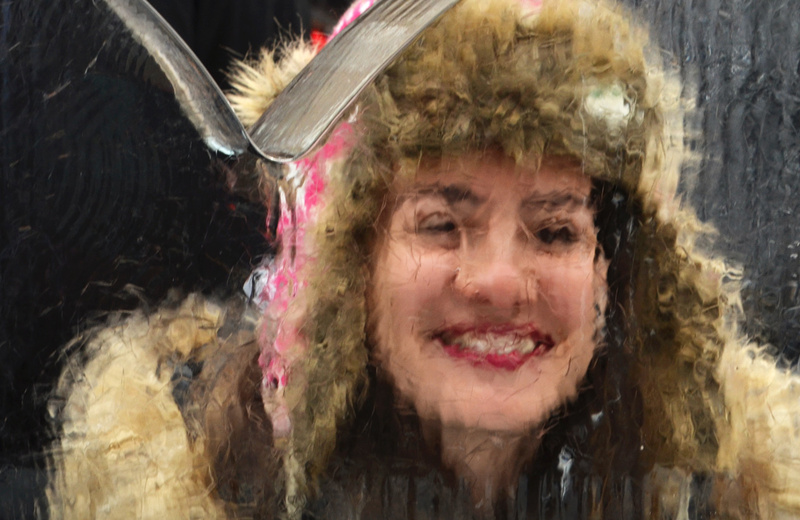 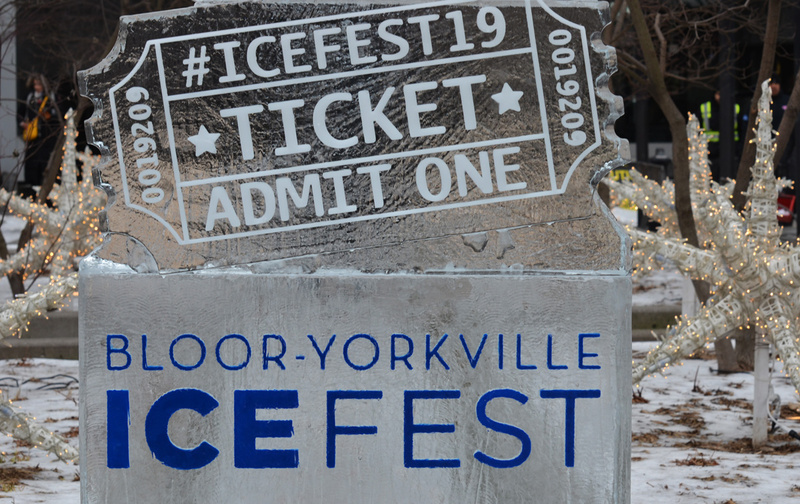 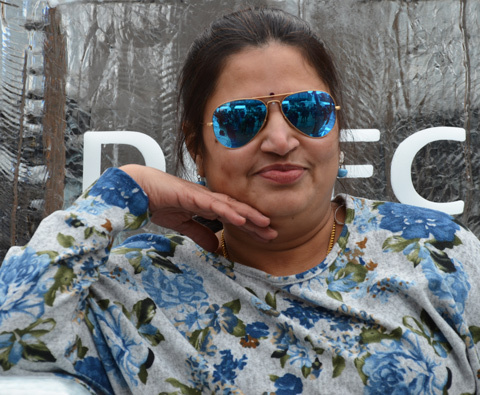 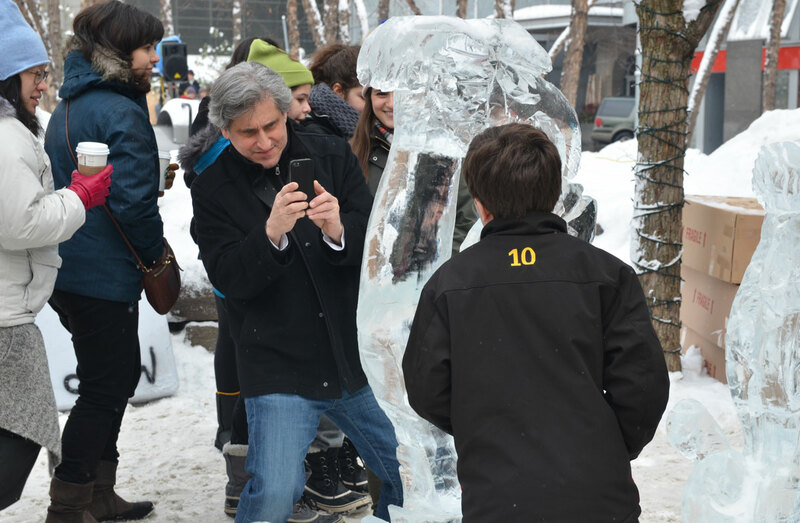 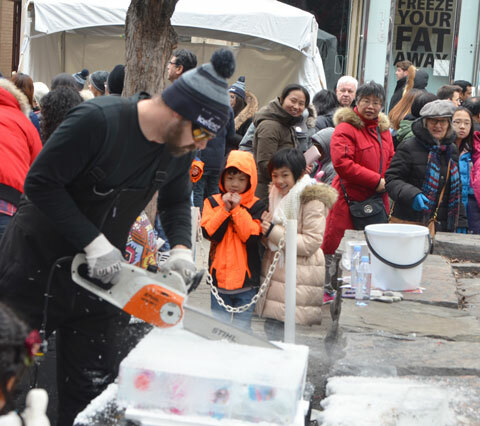 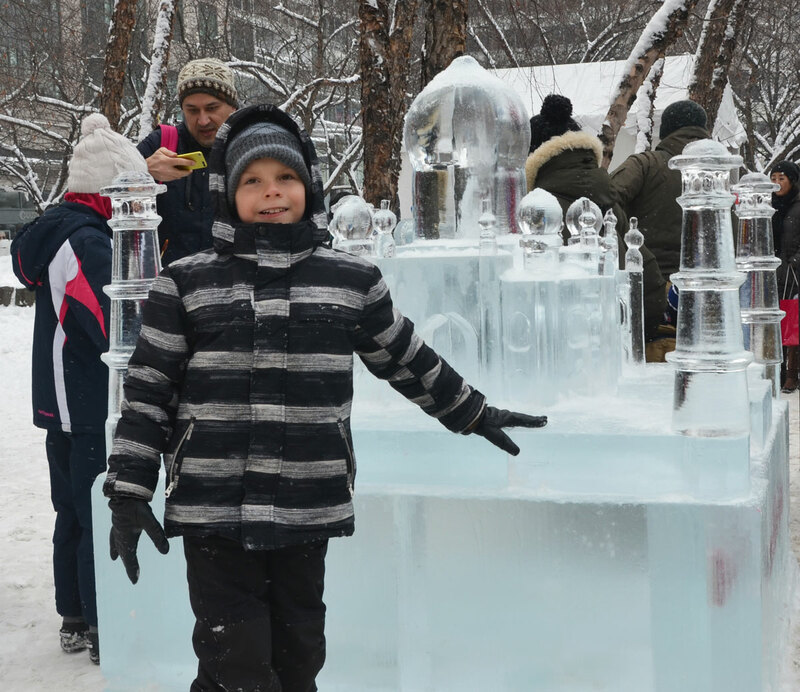 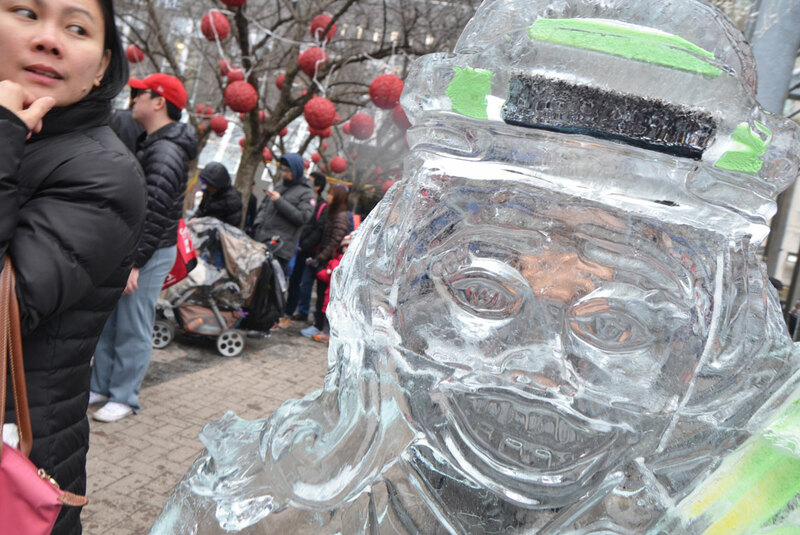 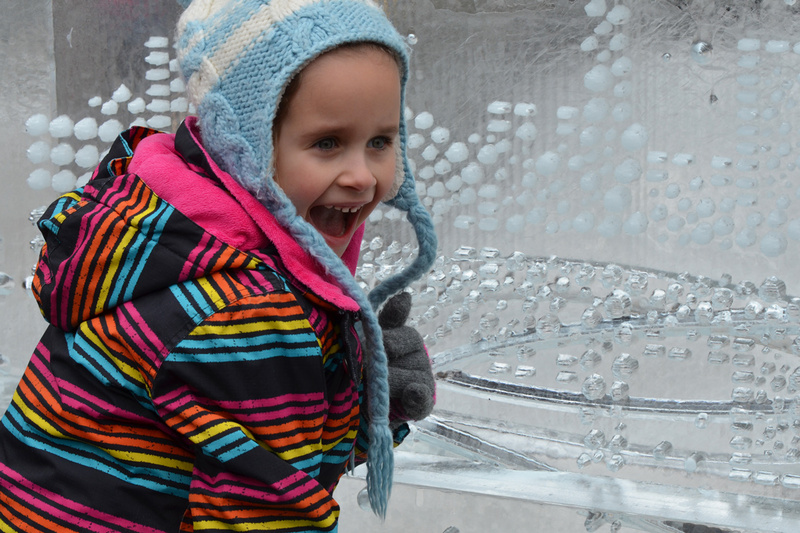 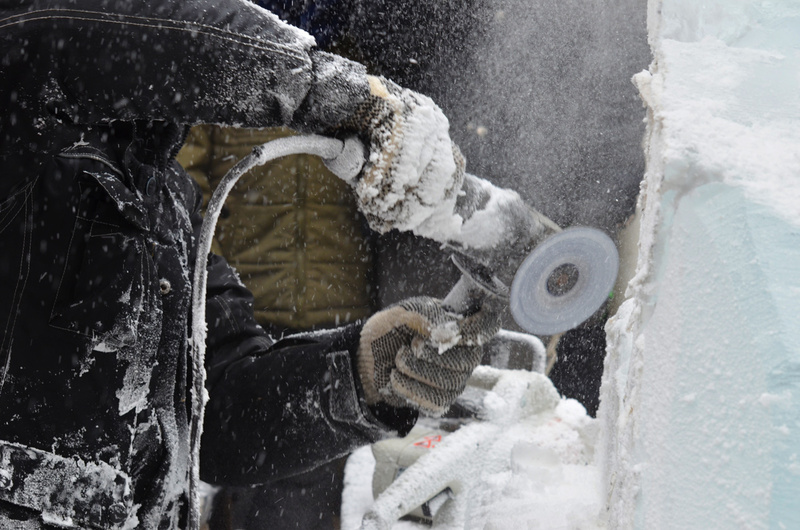 This past weekend was the 5th annual Bloor Yorkville Icefest. 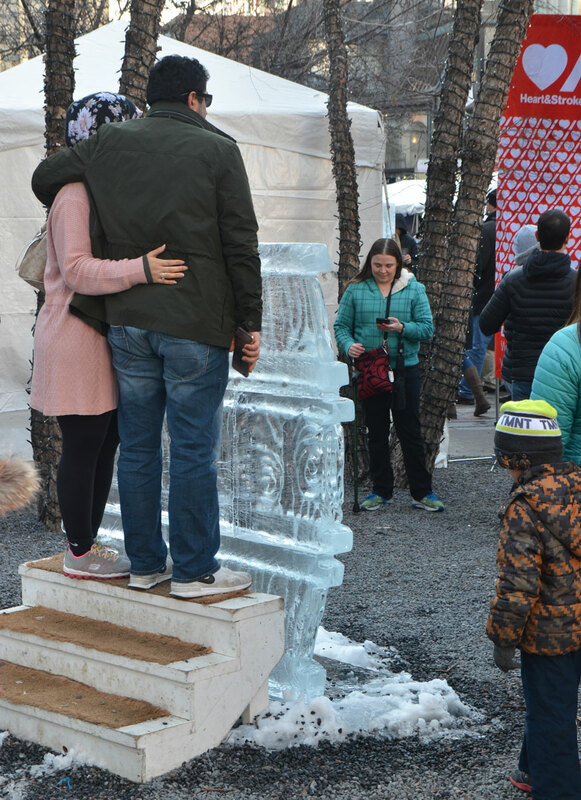 It’s an event that features ice sculptures in the park at Cumberland and Bellair. 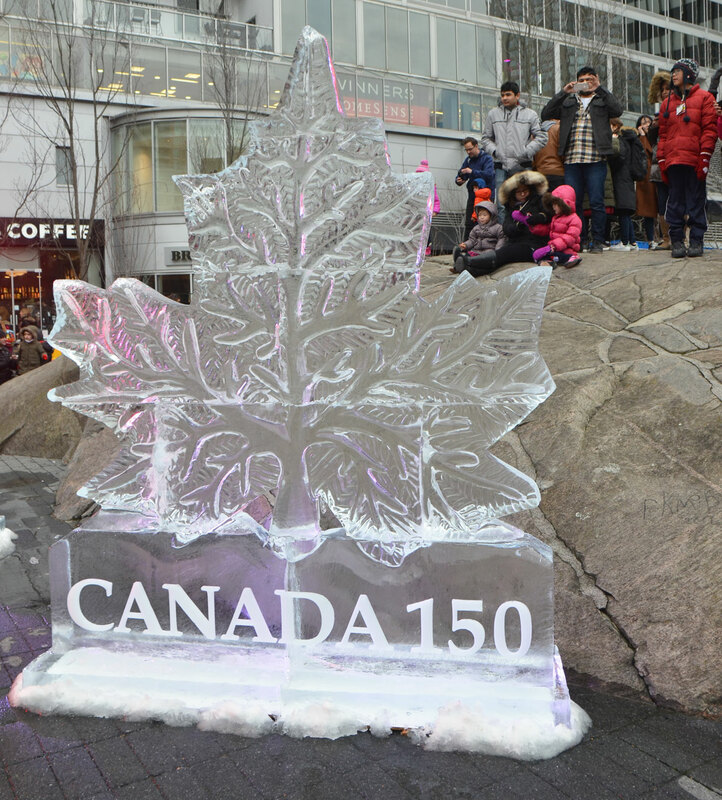 The theme this year was Canada 150, as 2017 is Canada’s 150th birthday. 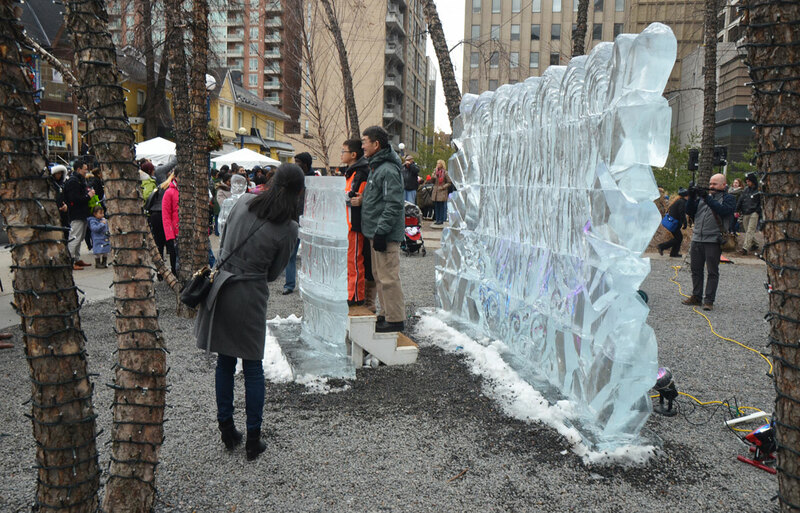 below: Sculptures in an enclosure (i.e. 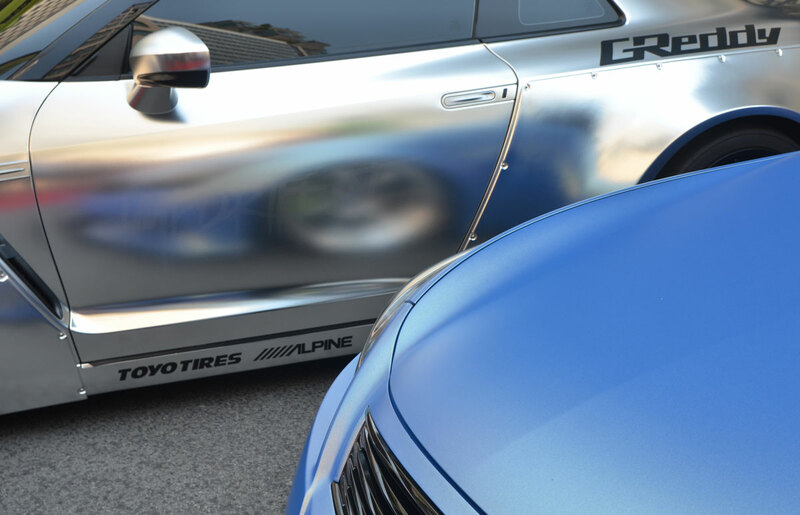 no one gets close enough to touch). 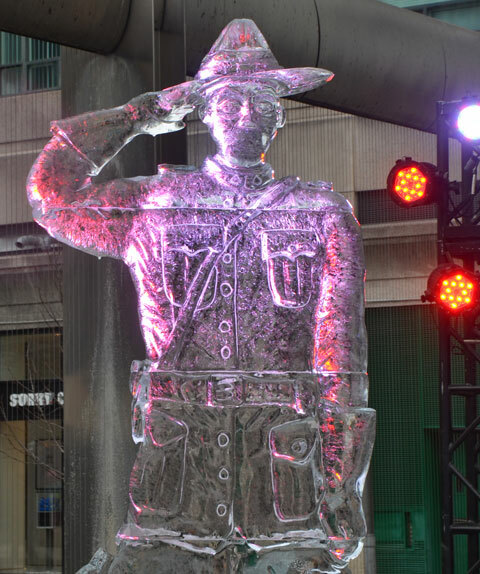 The Parliament building in Ottawa is on the left with a very tall RCMP Mountie standing beside it. 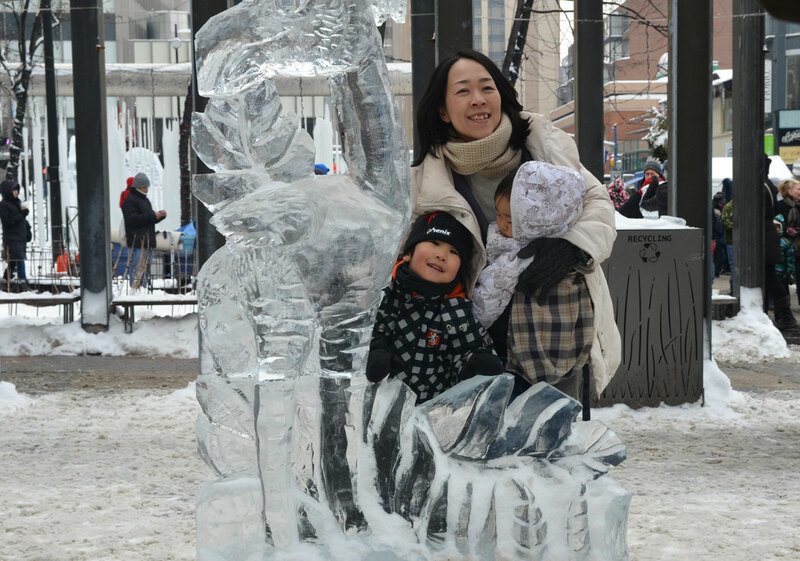 I’m not sure who the sculpture in the middle is supposed to represent. 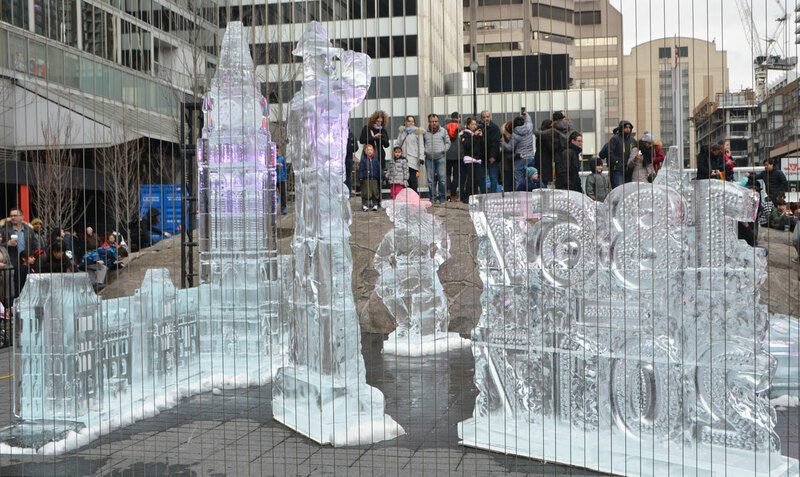 On the right, a large 1867, the year of Confederation, on top of a large 2017.
below: A number of artists worked on their sculptures as part of the festival. 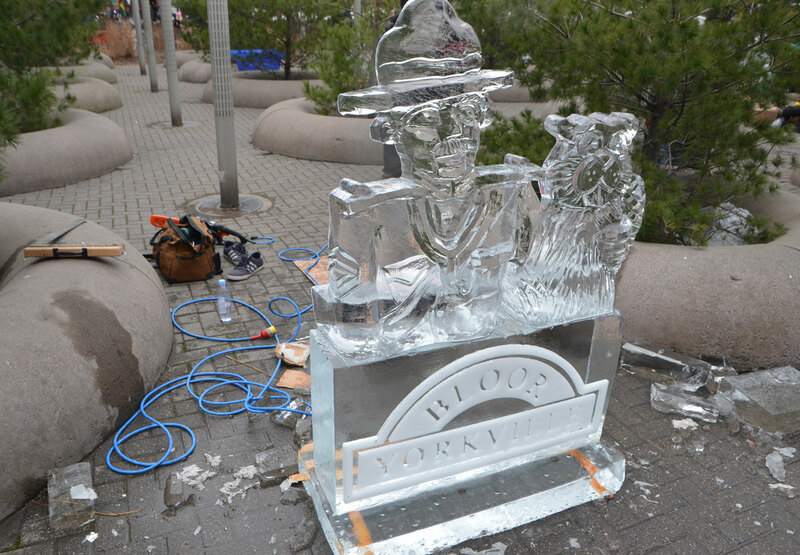 This mountie and beaver had just been completed before I arrived. 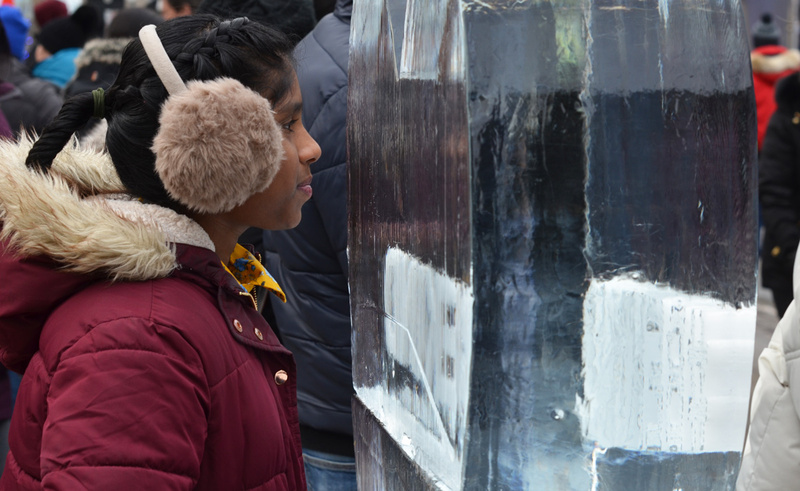 below: A large chunk of ice gets cut into smaller cubes. 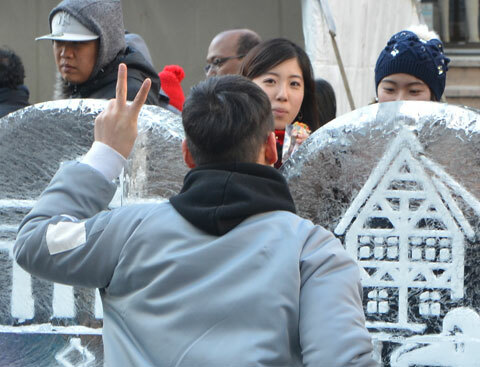 Each cube contains a small toy that had been frozen in the ice. 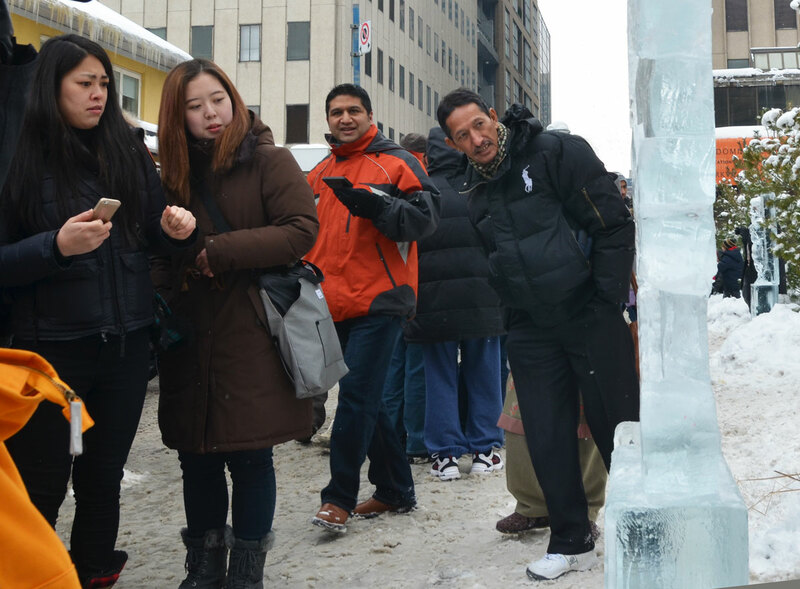 For $2 you could buy an ice cube and smash it to liberate the toy. 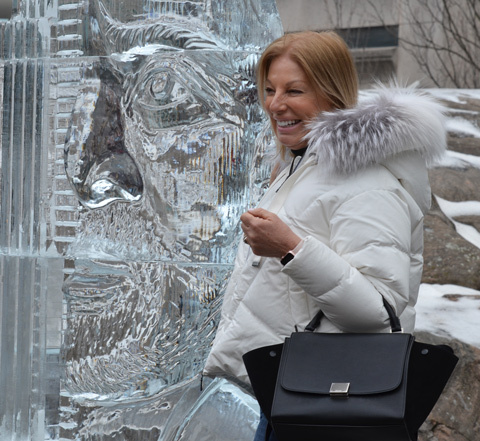 Don’t miss the sign in the background! 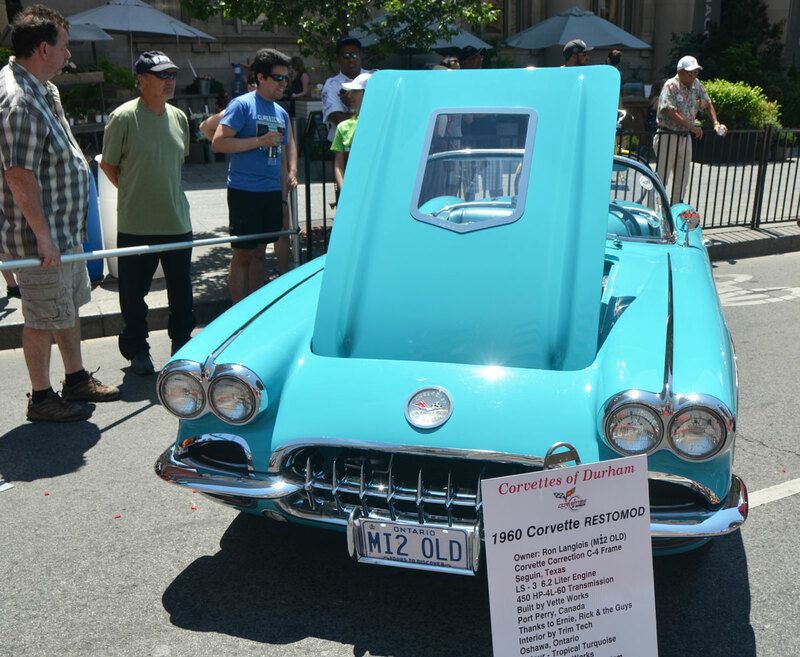 below: Complete with spelling mistake. 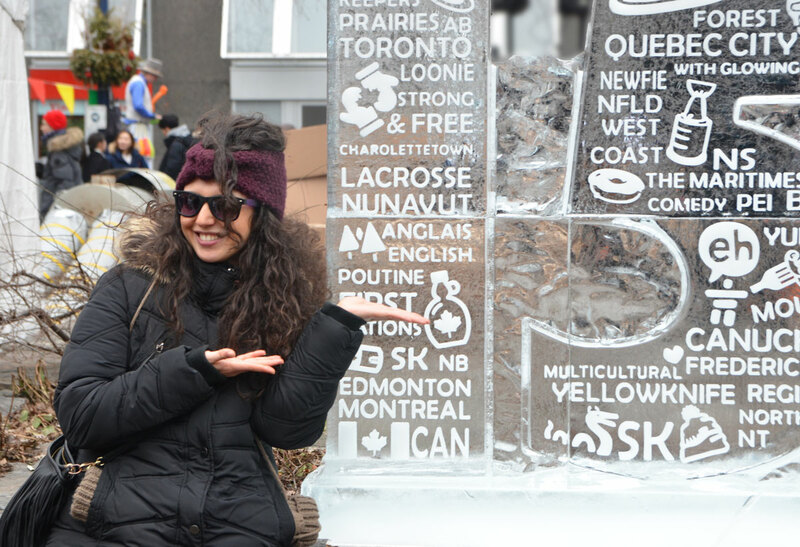 Charlottetown is spelled wrong. 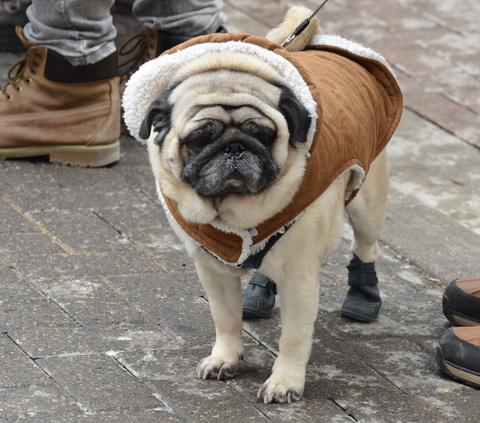 Also, the term Newfie is included? 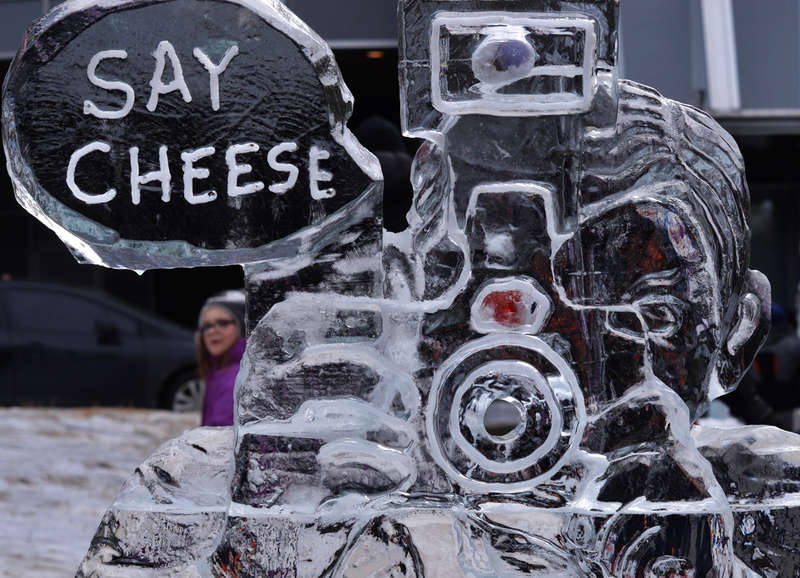 Apparently it’s no longer an insult to call someone a Newfie. 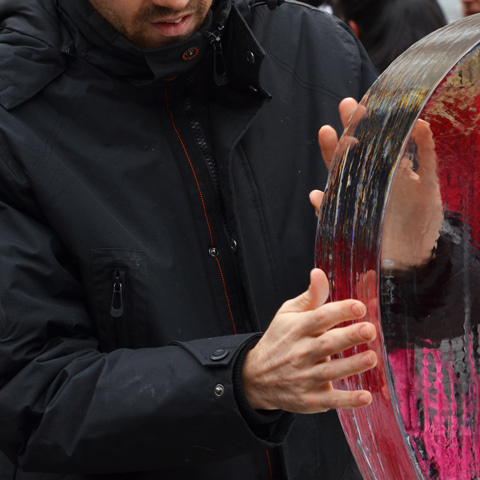 below: The warm temperatures were making some of the thinner pieces more fragile than usual. 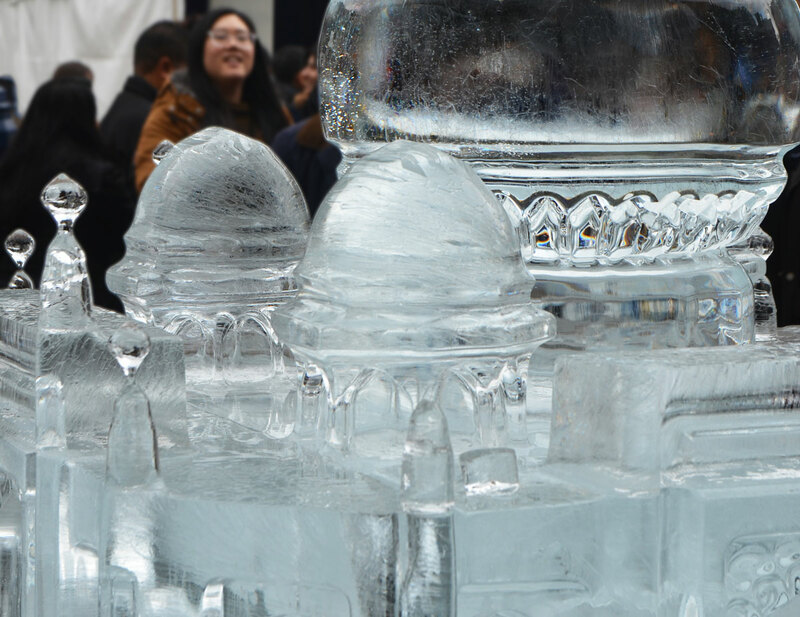 The little ‘knobs’ on this replica of the Taj Mahal were barely hanging on. 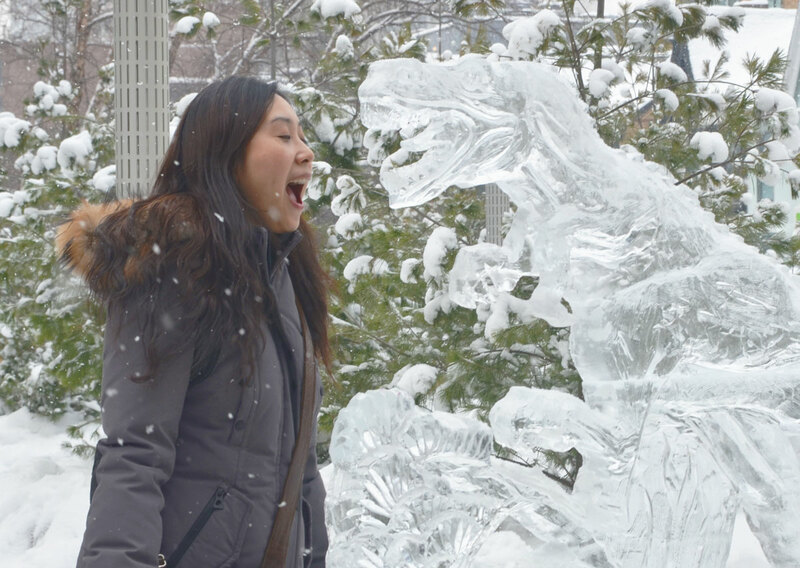 Luckily the temperatures dropped enough that most of the sculptures survived. 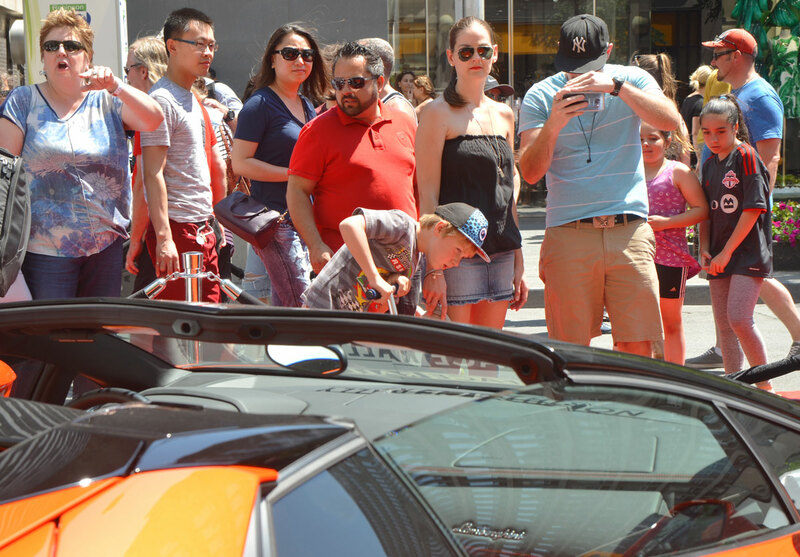 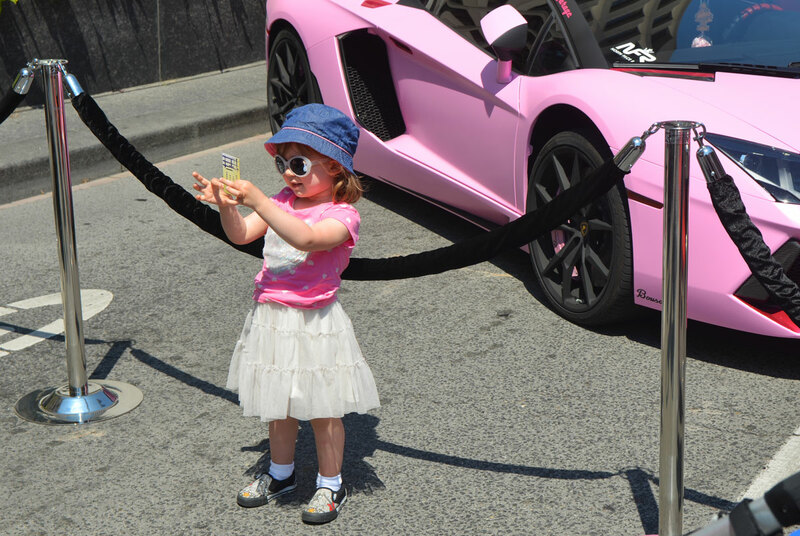 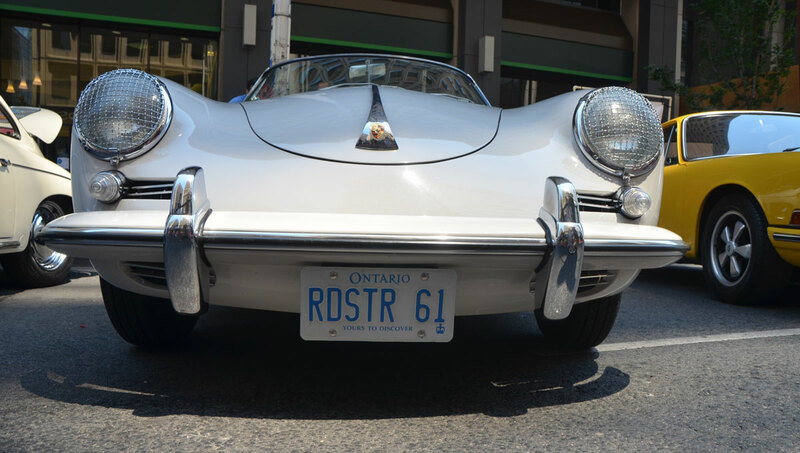 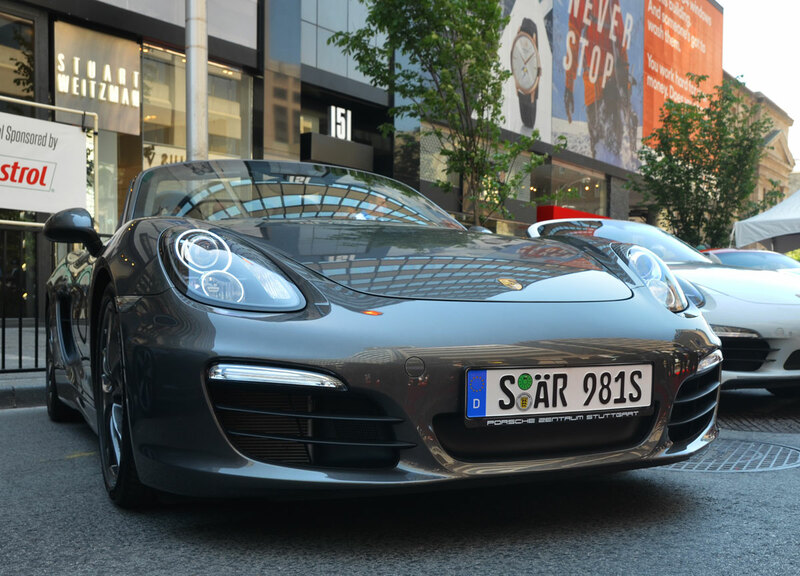 The 6th Annual Yorkville Exotic Car Show was on Bloor Street yesterday, Fathers Day. 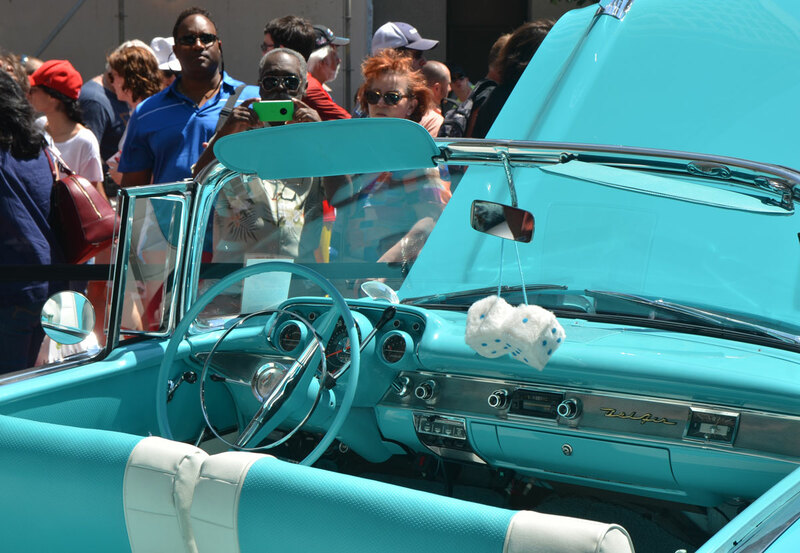 There were 11 different groups, or corrals, of cars…. 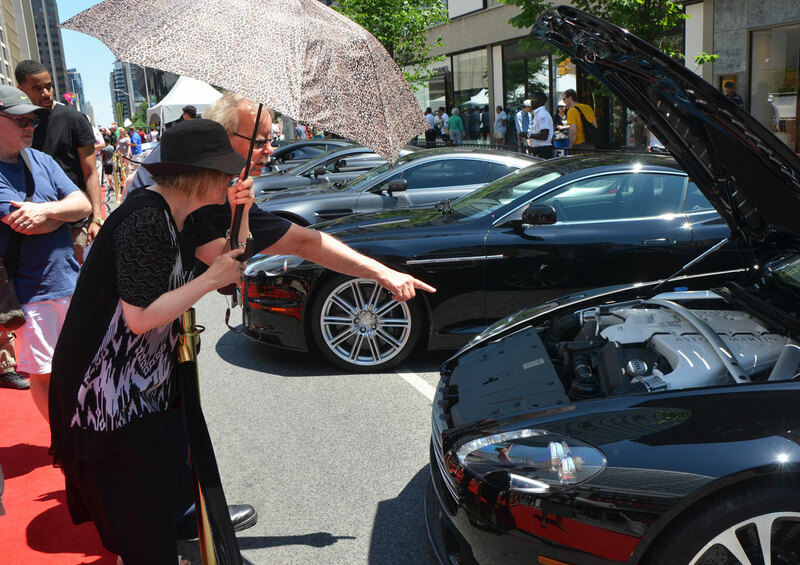 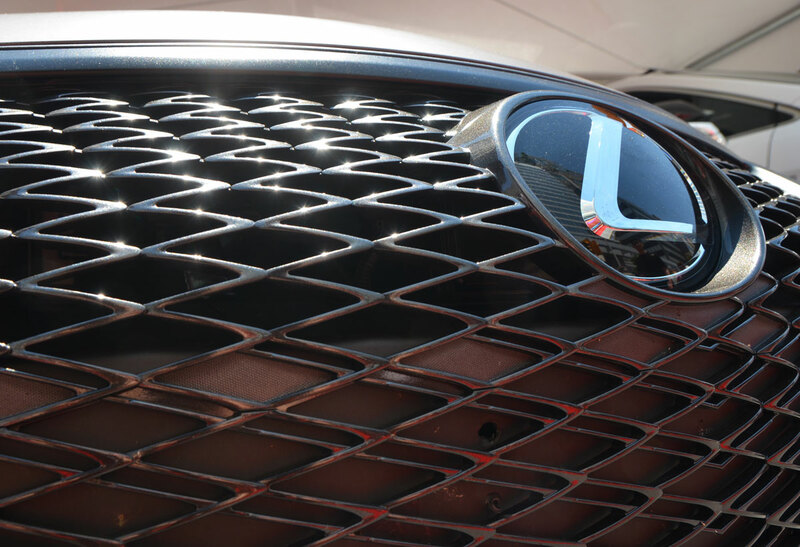 Ferrari, Lamborghini, Porsche, BMW, Aston Martin, Maserati, and many other car makers were represented. 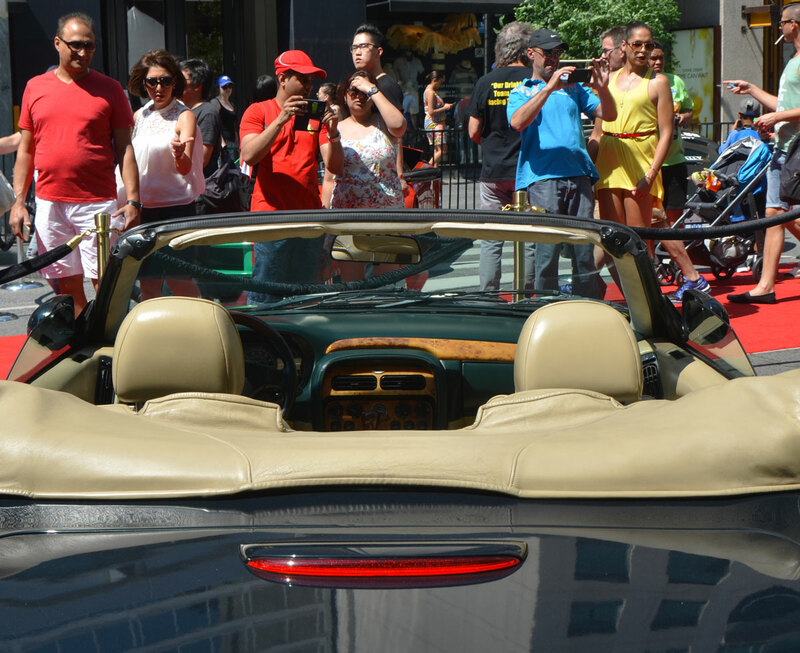 There was lots of sun and lots of people! 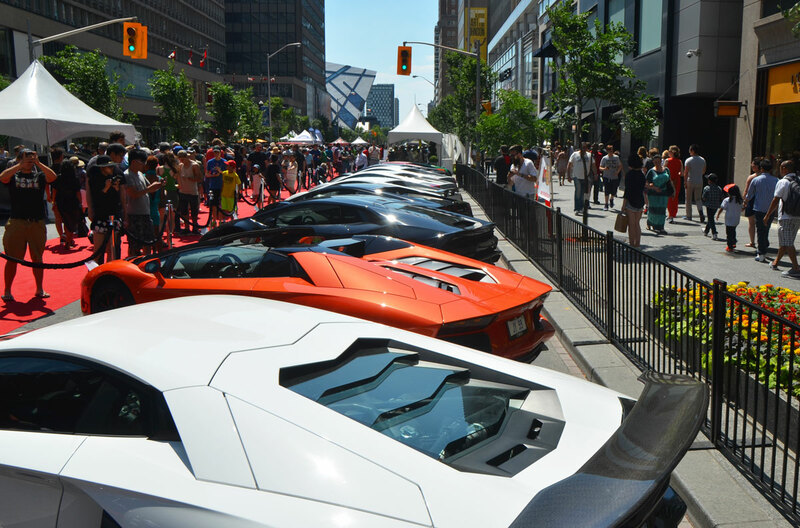 below: A line of Lamborghinis parked on Bloor Street. 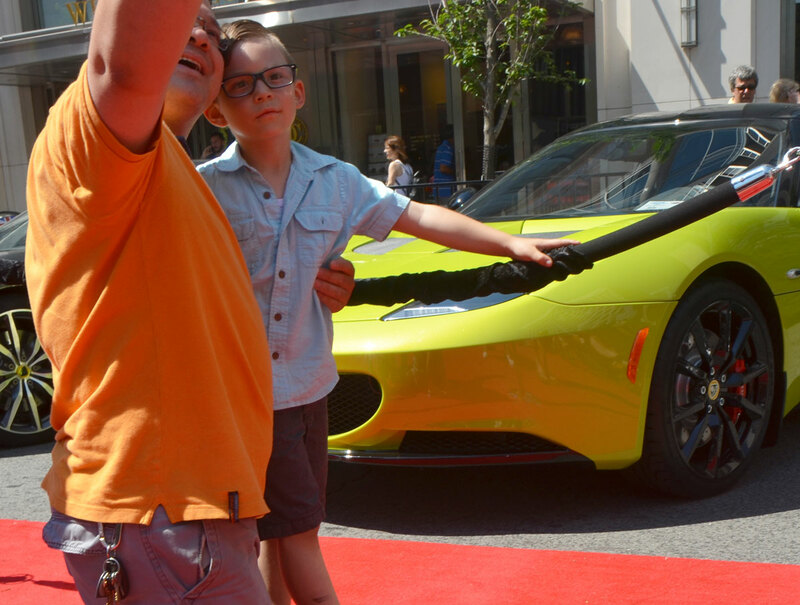 The cars were behind ropes and the spectators had a red carpet to walk on. 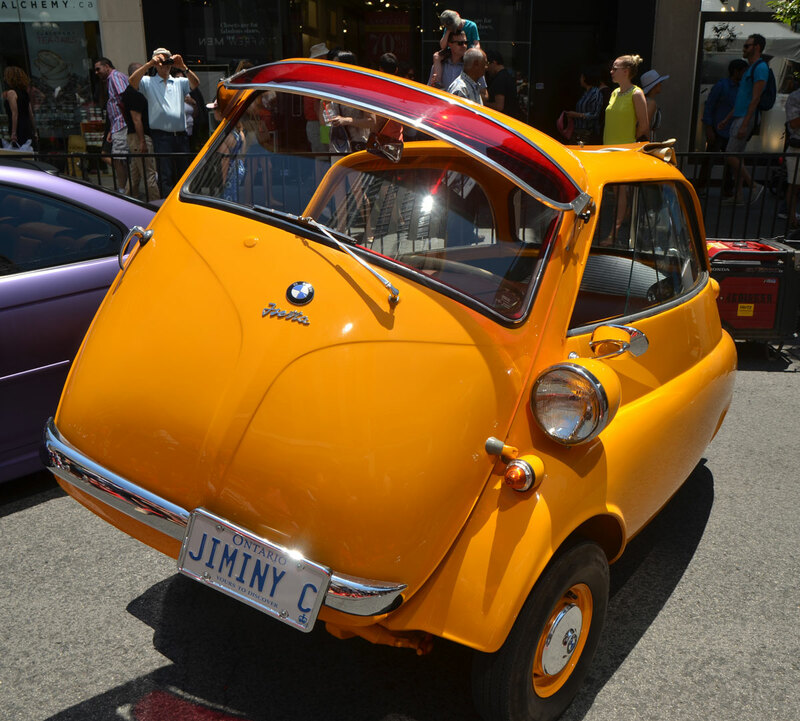 below: A cute little 1959 BMW Isetta 300. 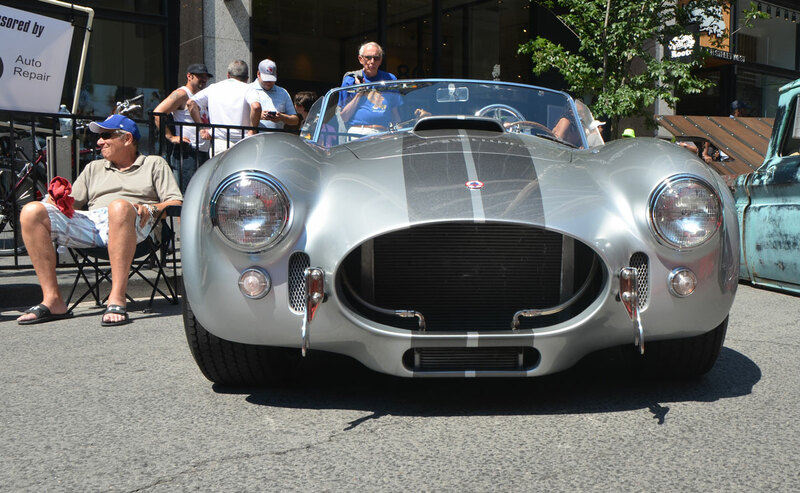 There are no side doors; the front of the car swings open with the steering wheel attached. 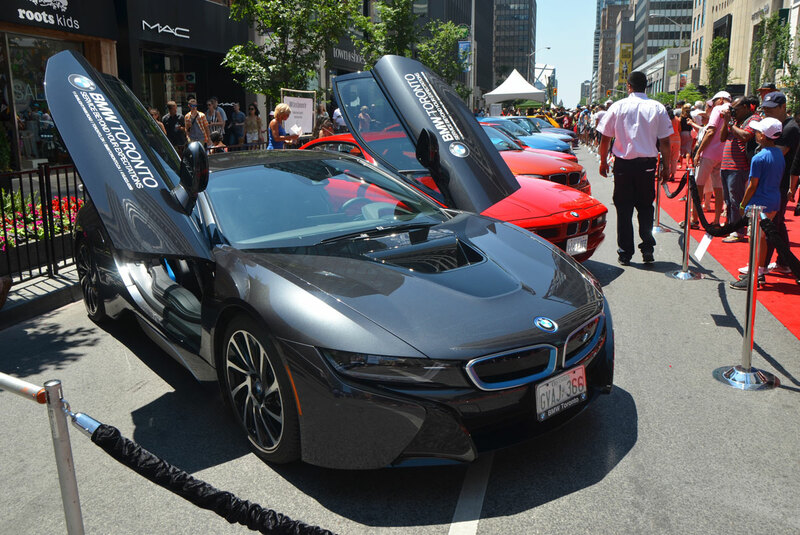 below: A black BMW i8 electric car with its front scissor doors open. 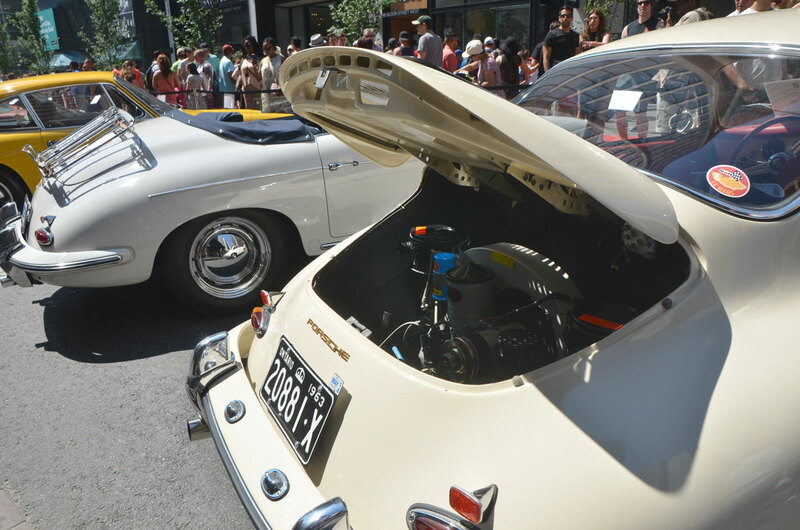 below: A Porsche from the 1960’s with its engine in the back. 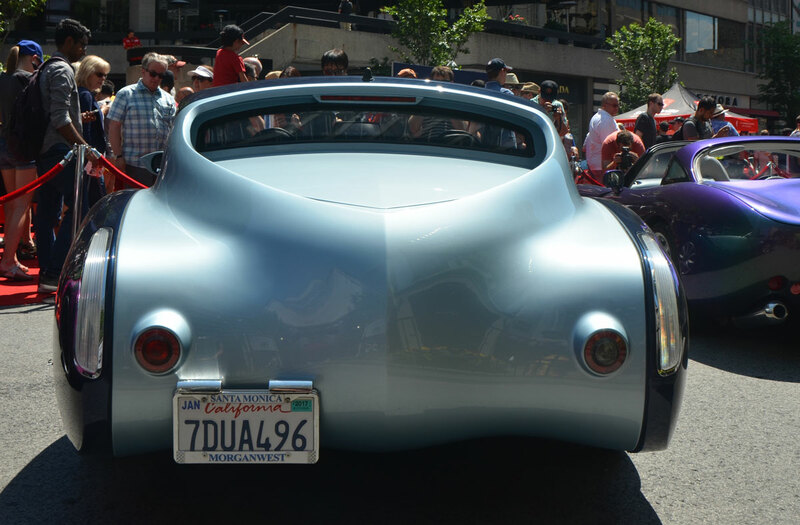 Not much trunk room in this car! 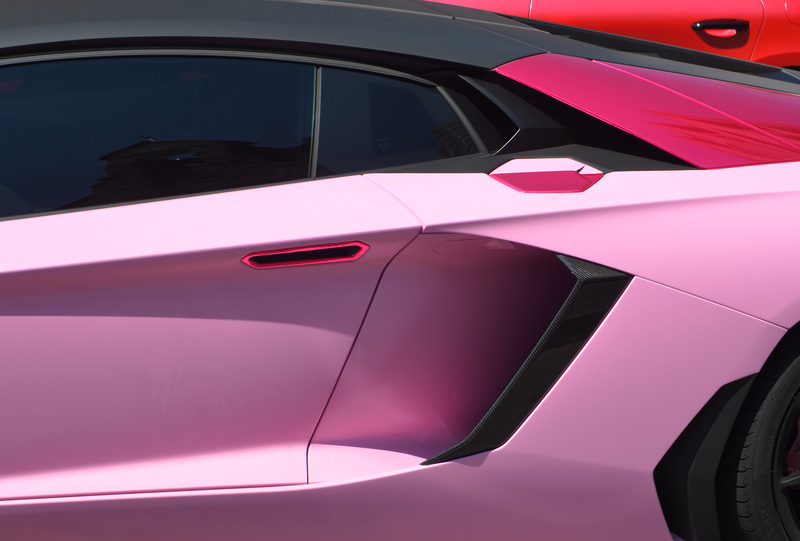 below: Pink and pink. 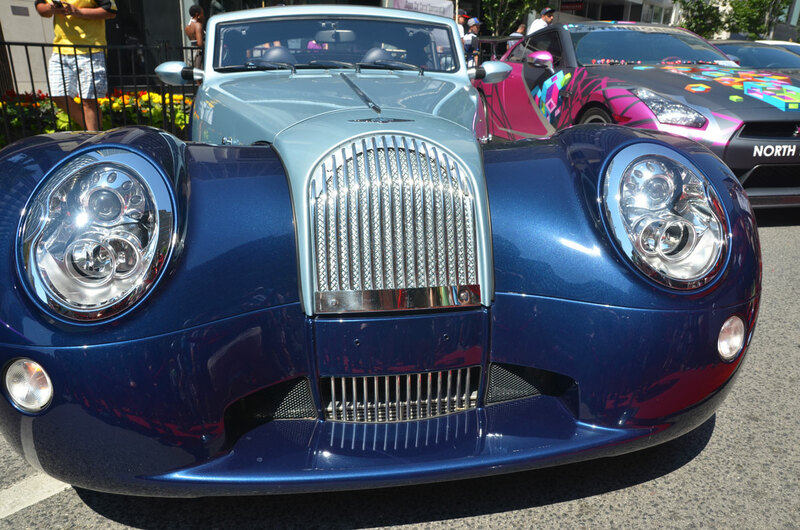 Standing in front of a pink Bousoughini from BGarage Ltd.
below: Morgan in two shades of blue, from the front. 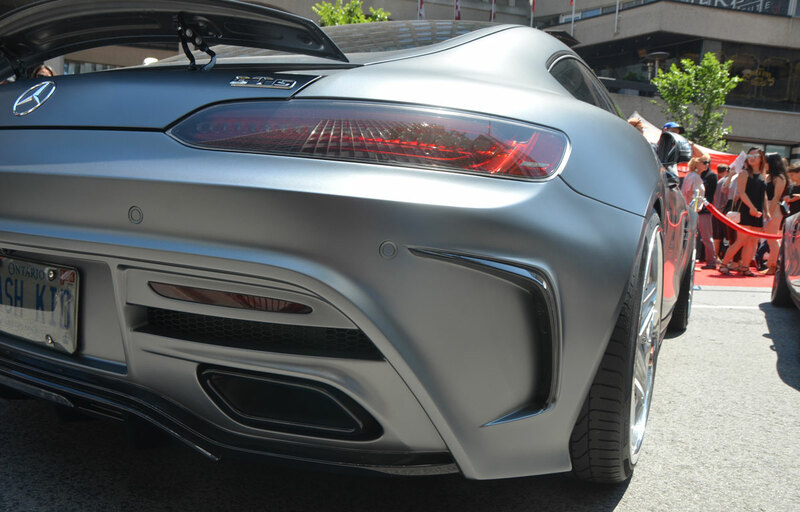 below: Same Morgan, but from the back. 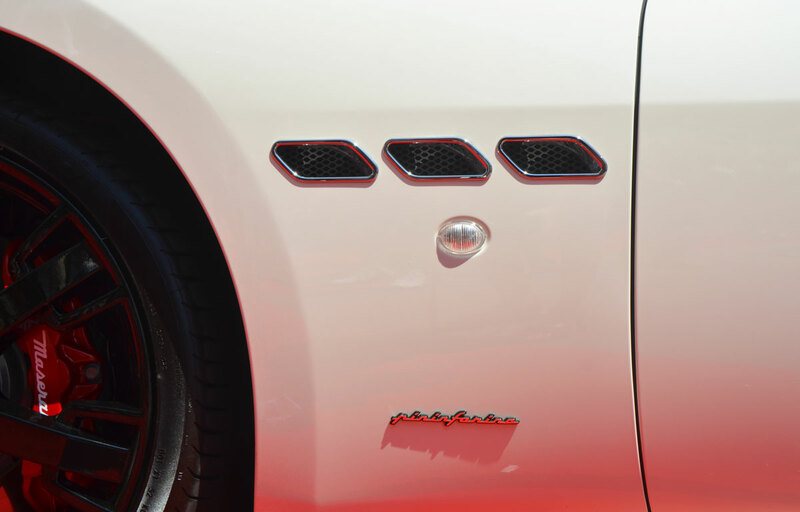 below: Pininfarina is an Italian car design company. 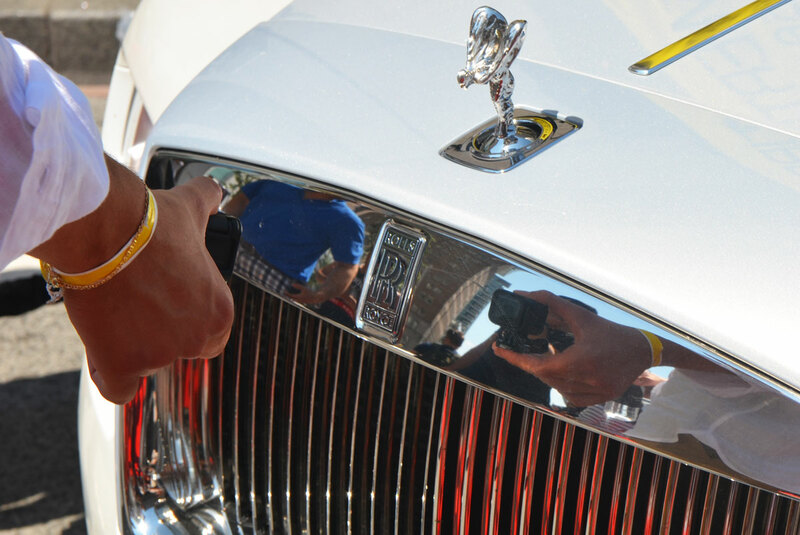 below: Photos of reflections in the front of a Rolls Royce. 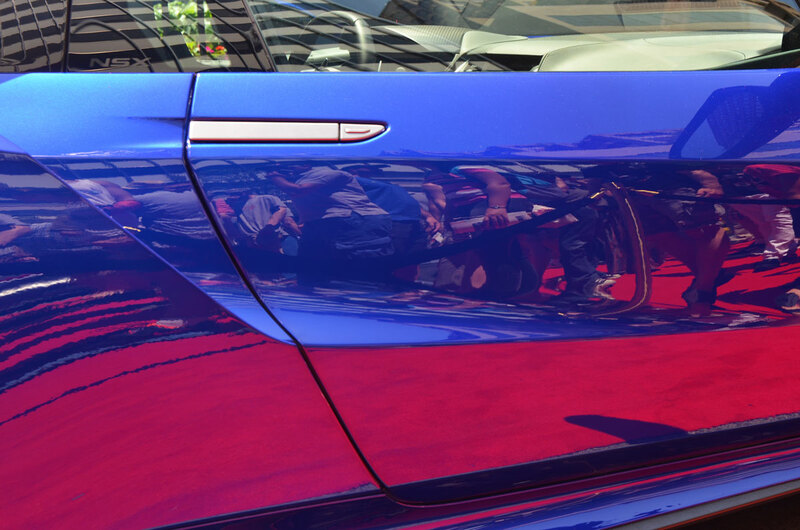 It seems I’m not the only one who takes reflection shots. 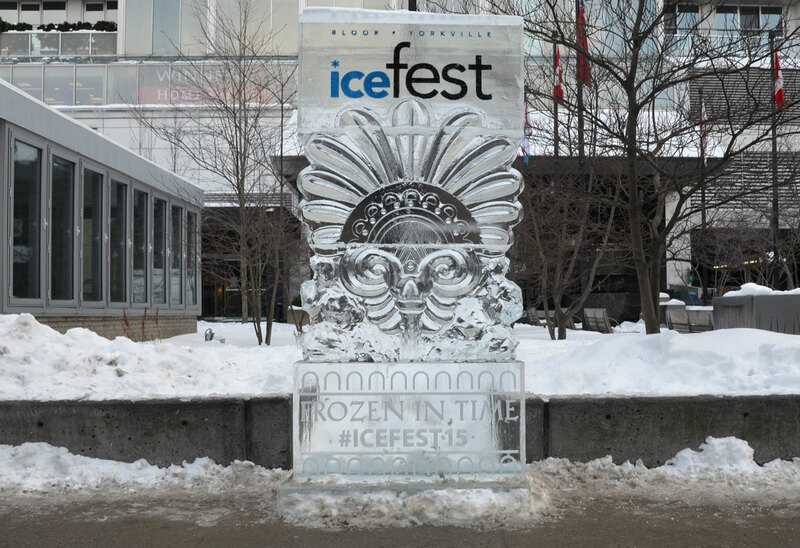 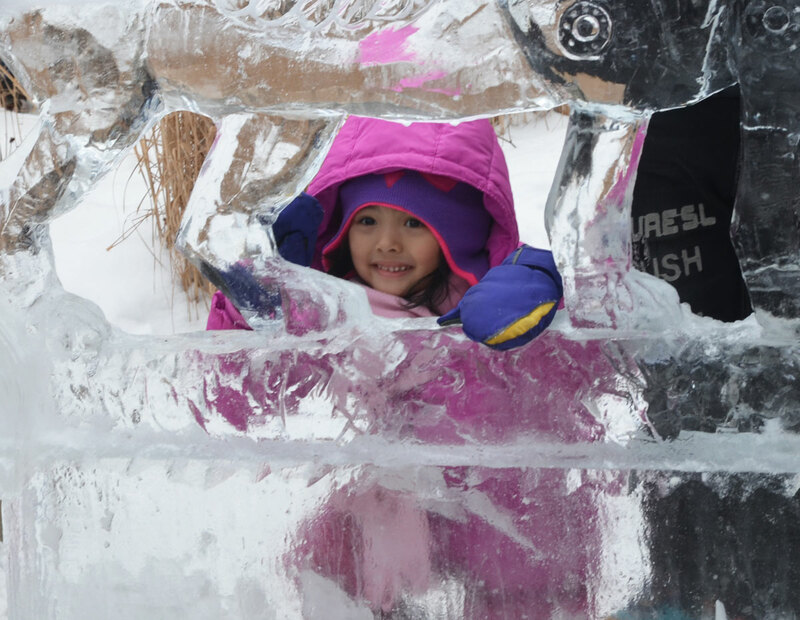 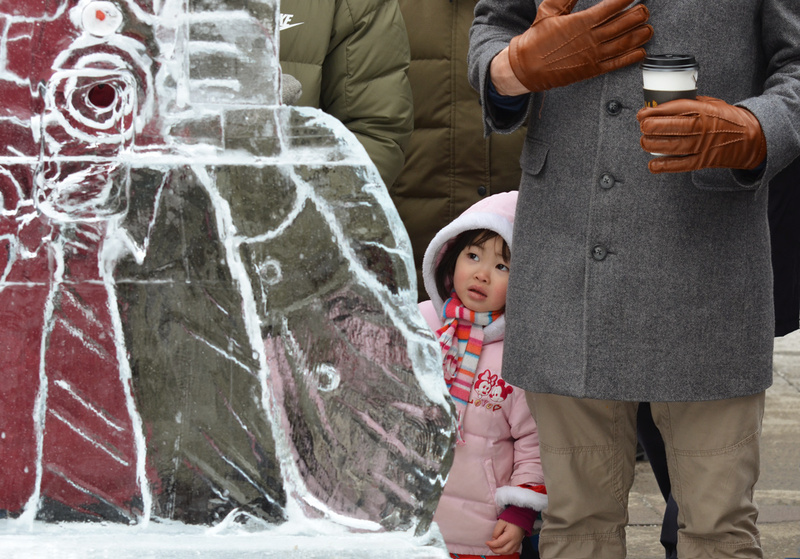 The 10th annual Icefest featured the carving of blocks of ice into Ancient Egypt themed sculptures. 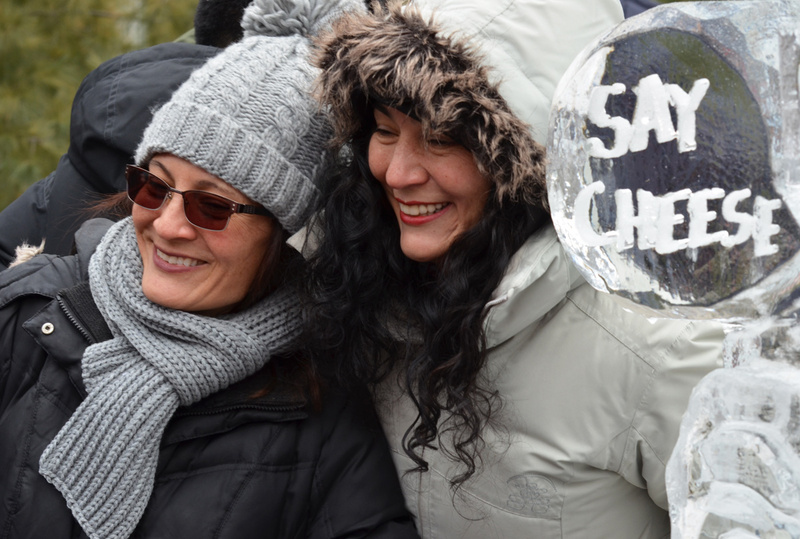 Both Saturday and Sunday were snowy days but the weather didn’t deter the crowds, or their picture taking. 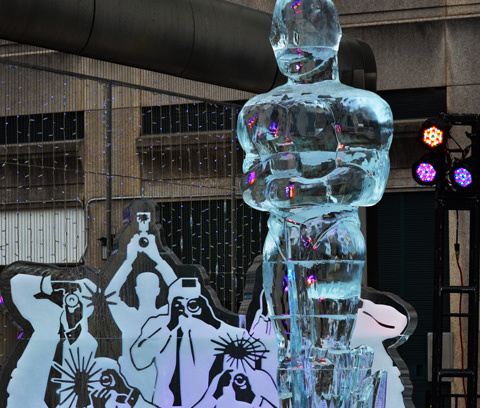 I’m sure that there are thousands of photographs of the sculptures! 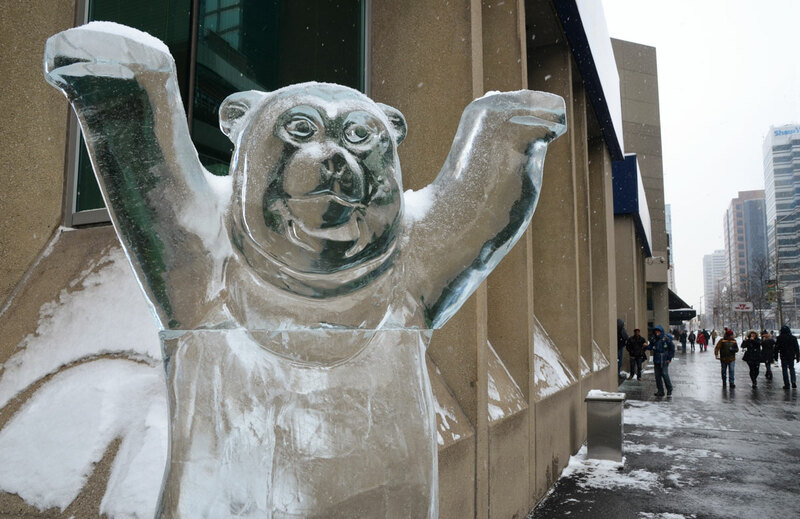 This bear loomed over the NE corner of Yonge and Bloor. 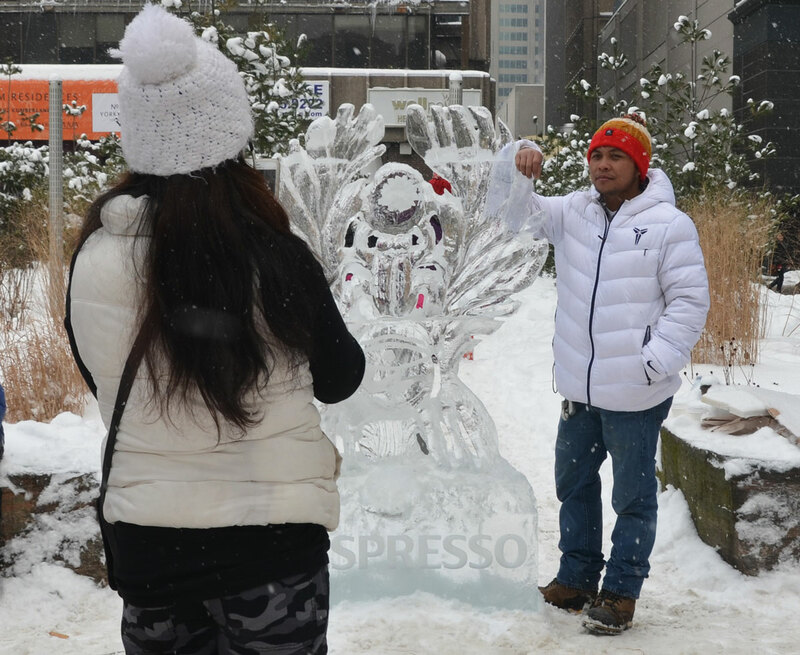 Most of the sculptures along Cumberland Ave (west of Bellair) are still there and will remain as long as the temperatures remain low and no one vandalizes them.